Weekly karma stats for LGF for the week beginning 06/10/2011 thru 6/16/2011 (Friday thru Thursday) [previous week’s stats]. It was a bland, boring week at the swamp last week. The departure of Walter seems to have been the last gasp of independent thinking there. 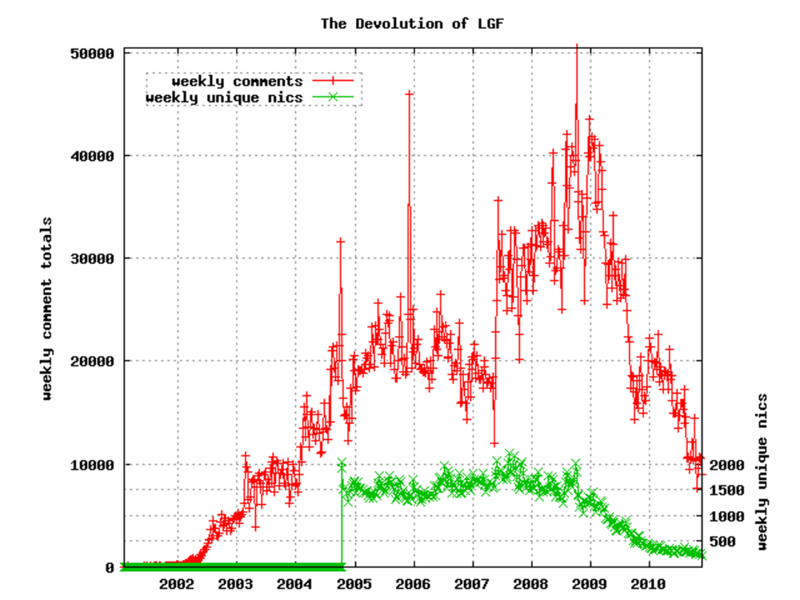 The average karma for every single comment last week at LGF was +1.70. Newcomer to the bottom ten navi won top spot in average negative karma. Relative oldtimer sattv4u2 took first place in total accumulated negative karma. 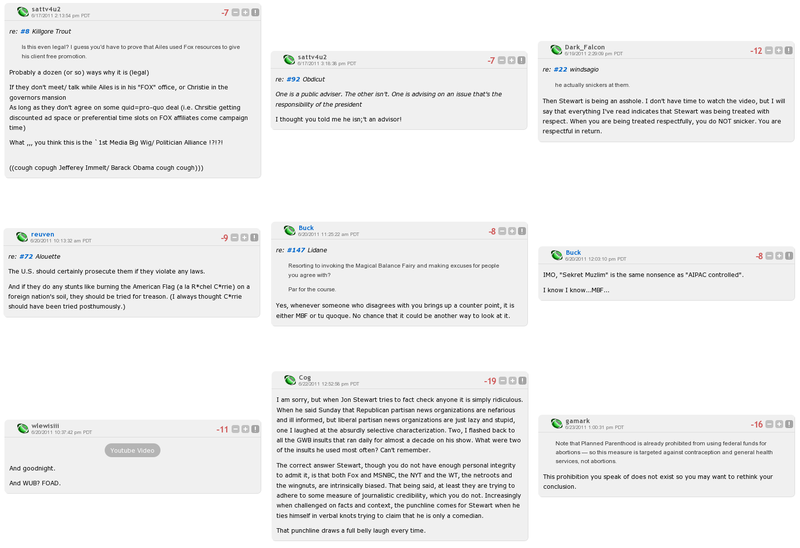 Below are the top dozen or so most highly rated comments of the week. Click the GIF image for a montage. NB – karma stats measure net karma; minimum of 20 comments required for karma-per-comment averages stats. Weekly comment stats for LGF for the week beginning 06/17/2011 thru 06/23/2011 (Friday thru Thursday). Last week cannadian club akbar displaced albusteve as most prolific LGF commenter. Charles wasn’t one of the top 25 commenters last week, and total comments were off about 20% from the week before. Coincidence, or causality? Gus802 is finally back, finishing in third spot. Windupbird‘s contributions have been spotty ever since he came out as a white guy; this week he didn’t even make the top 25. 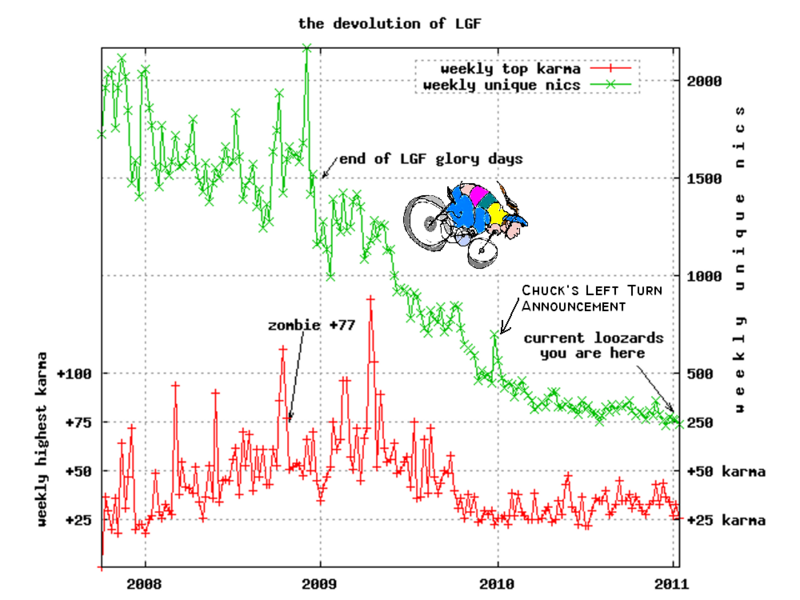 Update: Here are a couple of charts that help visualize where the current LGF is at in terms of weekly comments and commenters [charts current as of January 2011]. The format might be a little confusing – both charts each have two Y-axis scales, so you need to associate the proper Y-axis scale with the proper line in each chart. In both charts, the lefthand Y-axis scale is associated with the red line, and the righthand Y-axis scale is associated with the green line. Here’s an open thread, complete with a Jon Stewart “clown-nose-off, clown-nose-on” GIF, inspired by his recent self-aggrandizing comments with Chris Wallace. AoSHQ has a thread on the interview here. The pink border and comic sans are thrown in just to offend Bunk’s artistic sensibilities. Weekly suckage-efficiency and karma stats for LGF for the week beginning 06/10/2011 thru 6/16/2011 (Friday thru Thursday) [previous week’s stats]. No suckage stats were collected this week, but it’s a safe bet that the top two suckage-efficacy leaders for the week remained unchanged. Only either SteelPH or publicityStunted has been top suckup since we’ve been compiling the suckage efficiency stats. The average karma for every single comment last week at LGF was +2.00. Old reliable Buck won top spot in both average and total net negative karma. Bottom ten newcomer acfunk was in second place in total accumulated negative karma, with several of the most down-dinged comments for the week. Weekly comment stats for LGF for the week beginning 06/10/2011 thru 06/16/2011 (Friday thru Thursday). Loyal lizard albusteve again led the field in posting comments at LGF. Charles is again a prolific, top-20 poster. Gus802 and Windupbird are both back, so things are looking up, comment-wise, for the insular echo chamber. Anyone else notice that Johnson has changed the title of the 38755 thread? Hmmm, is that a rare LGF retreat? Here’s an open thread to discuss anything. UPDATE2: Next title change for LGF thread #38755? Now Why Would Anyone Think That’s a RETWEET Counter? How could anyone mistake that thing for a ‘retweet’ counter? I mean, other than because it looks like one, and Charles characterized it that way in one of his Tech Note posts, and the mouse-rollover on the LGF Pages called it a retweet counter, and… I mean, was it something Charles said? Is Buck defending Charles, or rubbing it in here? Engineer #1012, using The World's Greatest Blog Search Engine™, has recovered a sample of confusing statements by Charles about his retweet counter. We hasten to add that they’re ‘confusing’ only because none of us are as smart as Charles is about this technical stuff. How exactly does the number of clicks on the short URL act as a reliable proxy for retweets anyway? [Hint – it doesn’t.] Sounds like a job for timed-out, post-modern, science-guy LudwigVanQuixote. Addendum (ChenZhen): The old tweet counter was used for the first year, as far as we can tell, before it was changed to the current one.